This cake is really easy to make. 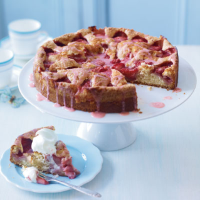 It's perfect served with light whipped cream as a summer dessert or with afternoon tea. 1. Preheat the oven to 180ºC, gas mark 4. Grease and base-line a 23cm spring-form cake tin with parchment paper. 2. Beat the butter and sugar together until pale and fluffy then add the egg and milk and whisk again. Beat in the vanilla and flour then spoon into the prepared tin. Set aside 6 of the halved strawberries and arrange the remainder, cut-side down, on top of the cake. Sprinkle over the reserved 2 tbsp granulated sugar. Bake for 50–55 minutes until golden and set. 3. Meanwhile, chop the reserved strawberries, sprinkle with 1 tsp of the icing sugar then set aside for 15 minutes. Press through a fine sieve to extract the strawberry juice. 4. Leave the cake to rest in the tin for 5 minutes, then lift out and cool on a wire rack. 5. Mix together 1 tbsp of the strawberry juice and the rest of the icing sugar until smooth and thick. Drizzle over the cake and leave for a few minutes to set. Slice and serve with softly whipped cream. For something extra special, try folding some Cooks' Homebaking Butterscotch or Fudge Pieces into the whipped cream before serving.